Not a particularly upbeat post title today, but it's an important topic too often overlooked. 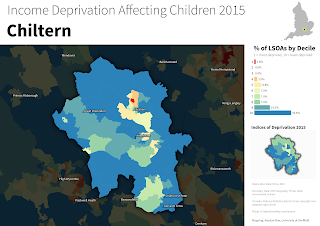 I wanted to shed some light on the matter because there are copious amounts of data on the issue, including those released as part of the 2015 English Indices of Deprivation, which I've explored in-depth in the past though a series of maps. 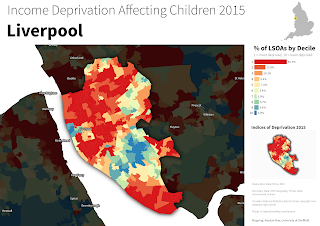 A recent Twitter message from freelance writer and HuffPost blogger Shumailla Dar prompted me to re-visit this topic (thanks) and since I had most of the data set up, I thought I'd do another map series - this time with the 'Income Deprivation Affecting Children Index' (IDACI) from 2015. See below for an example of what this looks like. In all maps, I've added a little inset to show the pattern from the overall Indices of Deprivation 2015, for comparison. I also show the percentage of each local authority's small areas in each decile on the IDACI measure nationally. 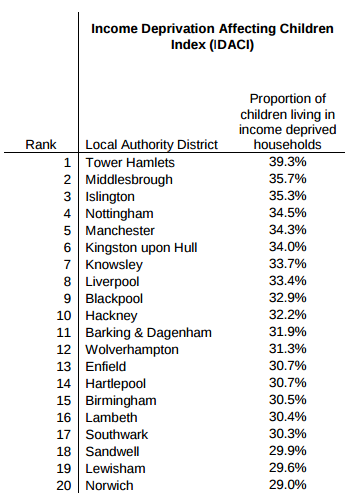 Okay, so what is 'income deprivation affecting children'? It's the proportion of all children aged 0 to 15 living in 'income deprived' families. 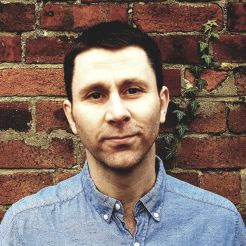 'Income deprived' is defined as 'families that either receive Income Support or income-based Jobseekers Allowance or income-based Employment and Support Allowance or Pension Credit (Guarantee) or families not in receipt of these benefits but in receipt of Working Tax Credit or Child Tax Credit with an equivalised income (excluding housing benefit) below 60 per cent of the national median before housing costs'. Again, not the most exhilarating topic, but given the impact this can have on young people's lives, it's such an important one. 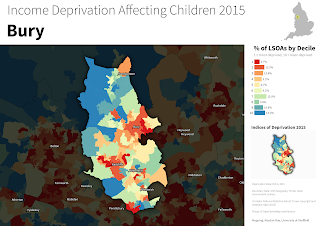 If you want more information on the details, see the Indices of Deprivation Technical Report. 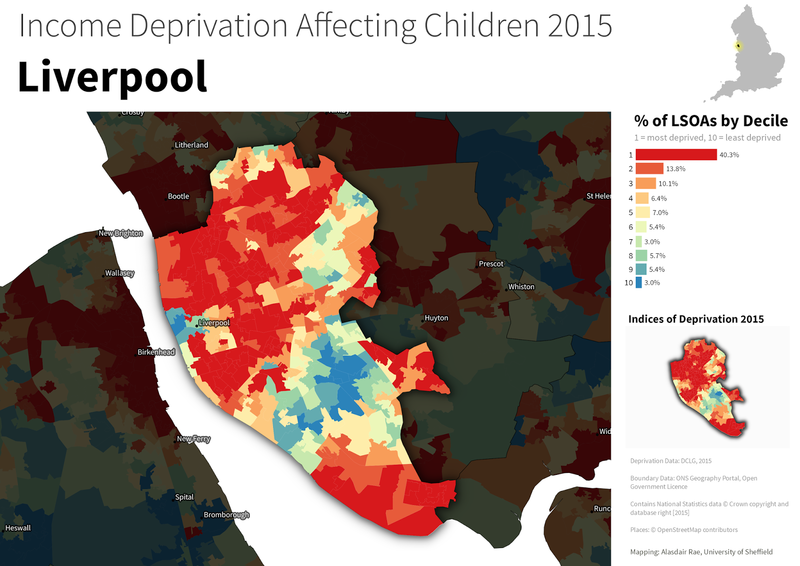 Beyond the technicalities, here's how it looks on the ground in Middlesbrough, the local authority with the second highest proportion of children living in income deprived households (35.7% overall). The Indices of Deprivation 2015 Research Report found, though a user survey, that whilst 99% of respondents had used the Index of Multiple Deprivation, the figure for IDACI was 69%. Still high, but it suggests a lot of people haven't looked at it, particularly since most respondents were people already working with the data in local authorities, universities, central government and charities. Most 'normal' people have very little idea that the data exists or what the patterns are like in their area - hence today's post. There is also a similar index which reports income deprivation affecting older people, but that's one for another day. 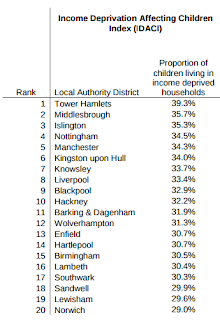 Before showing any more maps, here's the top 20 local authorities across England in terms of the percentage of children living in income deprived households. 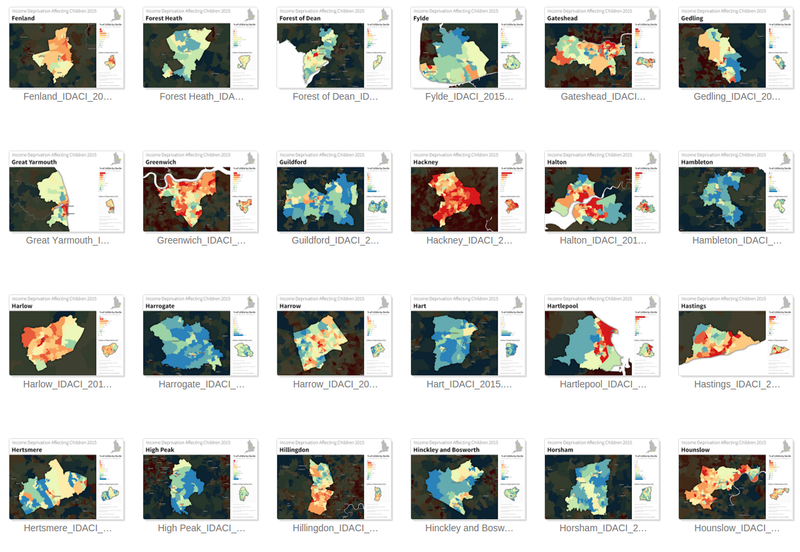 Now for some more maps, before I provide a link to the folder with a map of every local authority in England. First of all, here's Tower Hamlets. Remember that the bars show the percentage of small areas (LSOAs) in each local authority that are ranked in each decile within England - which sounds a bit confusing, I admit. To give an example instead - for the map below, 54.2% of Tower Hamlets LSOAs are ranked within the most deprived decile in England on the IDACI measure. Just bear in mind that the maps present a relative picture for England as a whole and that, broadly speaking, red = bad and blue = good. What does any of this tell us? 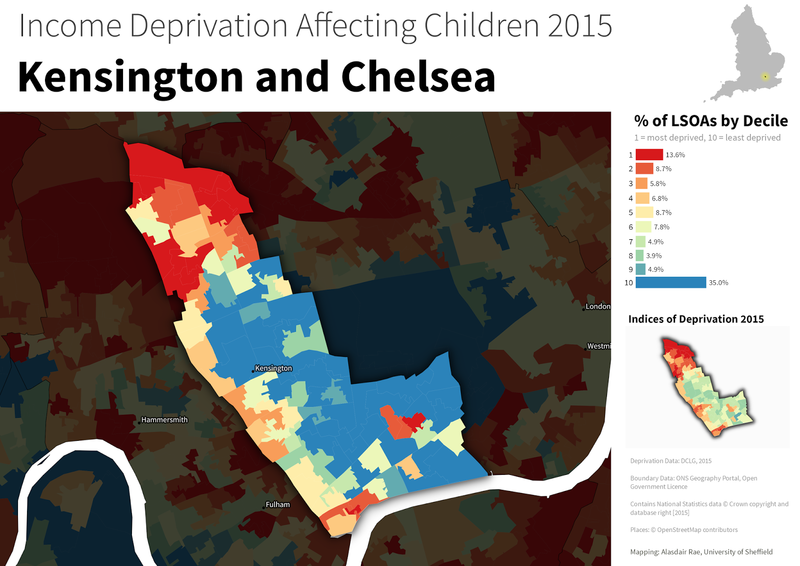 Of course, we know that some places are rich and some are poor and that this will inevitably have an impact upon children in those areas but these maps reveal nothing of cause and effect. 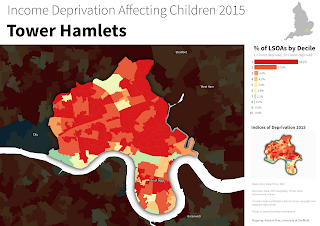 Rather, I hope they will provide local agencies, analysts and residents with an opportunity to explore patterns related to income deprivation affecting children in their area and perhaps to think about a topic they hadn't before. It's certainly not a new issue but one that, I think, we could do a lot more about tackling. But that's a step too far for today because I just wanted to share these maps after running off a new batch after being prompted to think about it. 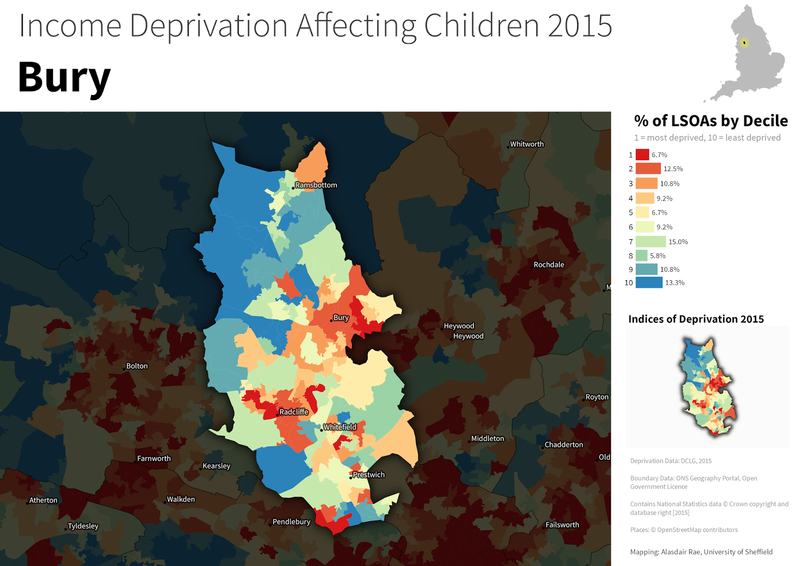 If you want to see comparable maps for the 2015 Indices of Deprivation overall, the 20% most and least deprived and other varieties of deprivation map, see my main IMD 2015 page. If you find any of these maps useful, feel free to use them and share them. Notes: you can find full details of the data and method on the government's English Indices of Deprivation 2015 web page, including the IDACI spreadsheet. I'm not a member of, or affiliated with, any political party in case anyone asks about the red and blue colour scheme! The labelling is a bit wonky in places owing to the variable coverage of OSM data. I did a version with Ordnance Survey labelling too but this had too many points, but hopefully some of the labels help identify key areas you are interested in.